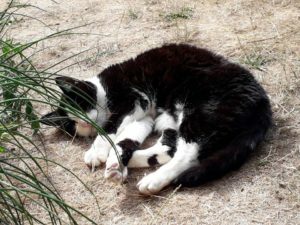 ””I took my little kitty ’Bettemis’ and her sister into my care from Tøstrup shelter and animal welfare center, she was so small that we didn’t think she would survive, but she did. And when she was 2 years old she fell from a window and broke her pelvis in two places, this she survived as well. 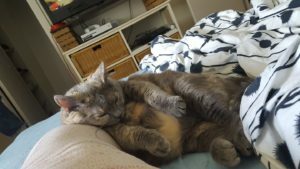 She is the most cuddly and affectionate cat I know, although she stamps when she walks. I have 4 cats and a dog.” – Lilian Fischer Krarup, from Denmark. “This is my darling boy Yumyum. He was rescued from a very hectic household. Kids chasing and pulling his tail. So he was shut in a room with a filthy litter tray. He was two pounds in weight and eight weeks old. He was a feisty wee soul to begin with, but has settled in fine. He is now 14 yrs and has been diabetic for many years now. 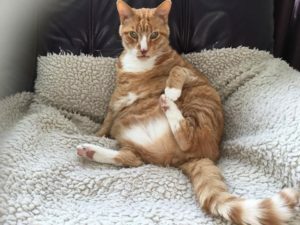 He has Insulin twice a day and special low carb biscuits. He has me wrapped around his little paw” – Helen, from the UK. ““This is Fröken Fräs. 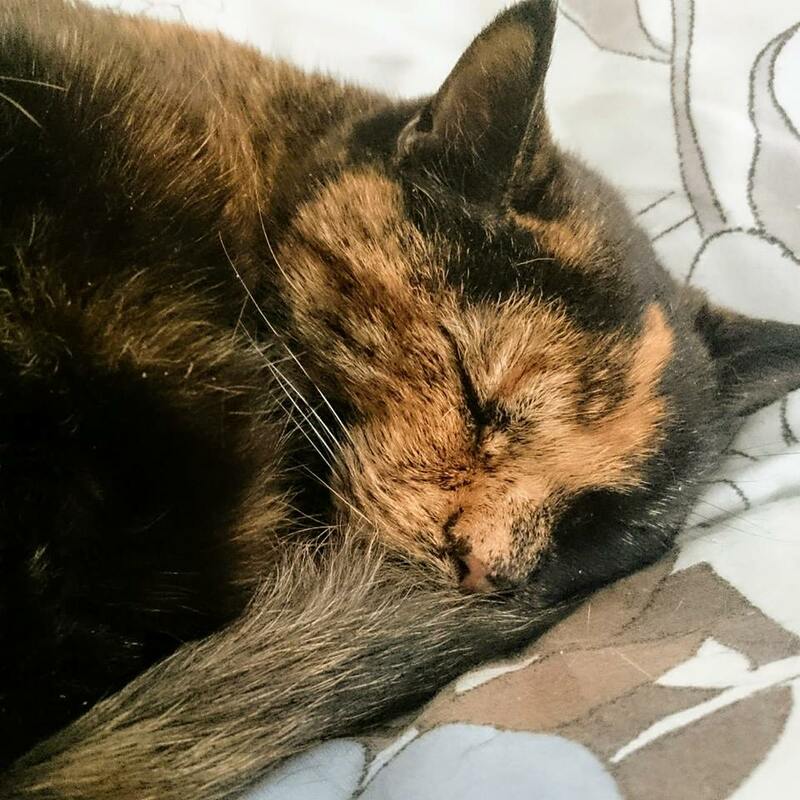 She waited for 10 years for a new home at the rescue centre in Lidköping. She was somewhat aggressive, not very outgoing, and no one’s first choice. It didn’t get easier when she got older and started getting dental issues. Now she lives in Dalarna and is a beloved family member of ours since a few years back. She loves prawns, to sleep in the sun, play with balls or just lay close to us and cuddle. 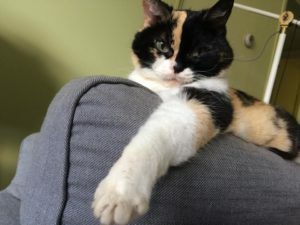 There are a lot of cats like her out there – those older cats with a few flaws that, almost, no one wants.” – Pia, from Sweden. “This is Jessie! She was rescued by Little Valley Animal Shelter and painstakingly nursed back to health after being found with her back leg completely skinned 😞 They thought they were going to have to amputate but their amazing care meant they didn’t have to in the end. It was a very long road to recovery but she is now fit, healthy and a beloved member of our family” – Charley, from the UK. ““This handsome cat is iPoes! I adopted her in 2010 from ‘t Julialaantje in Rijswijk (the Netherlands). Although she’s my cat, I can honestly say she is one of the sweetest cats I’ve ever met. She will never scratch or bite. Except the neighbor’s tomcat, she will make sure he leaves our house immediately! 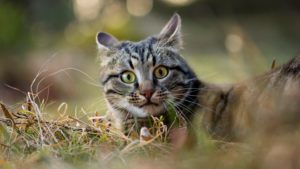 According to the animal shelter, iPoes used to live in a house with many other cats and dogs. In the beginning she wasn’t very social, and it took almost 2 years before she felt comfortable enough to sit on my lap. But this is not a problem anymore: now she likes to sleep next to me under the duvet with her head on my pillow! 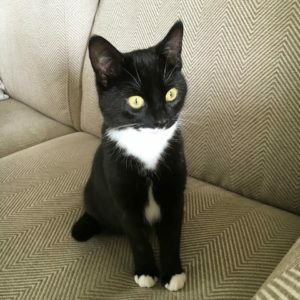 Although she’s very sweet, she’s not very clever… She is a very small cat and according to the vet her head is just too small for a big brain. But even after 8 years she still learns new things every day!” –Pauline, from Holland. Jag älskar båda lika mycket.” – Annika, from Sweden. ““Bibi, has been rescued 9 years ago! We found him straying in our neighborhood a very cold and snowy day of winter, we presume his owners decided they didn’t want him anymore. He came to my door, I let him entered and he never left. 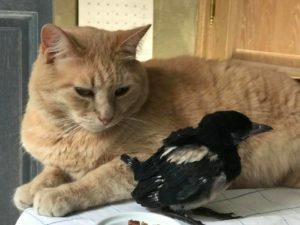 He is so thankful that he accept all the new rescues animal in our house, even this bird that doesn’t want to leave haha” – Joëlle, from France. 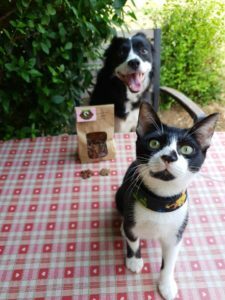 ““Hi, let me introduce you to Obi & Ficelle! We have recently adopted Obi, he is a 3 months old kitten that we found in the street where he was starved and sick! 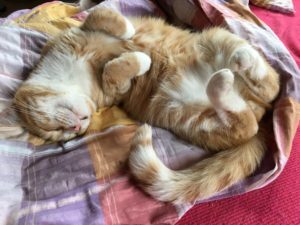 Today, he lives the perfect life with his soul sister Ficelle which we have got from a rescue center located in north of France.” – Cassandre, from France. 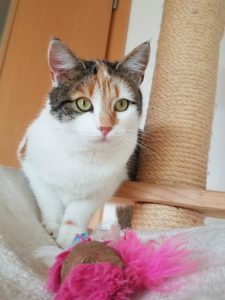 ““We picked up our cat Mia from the rescue centre in Murtal / German in September 2017. 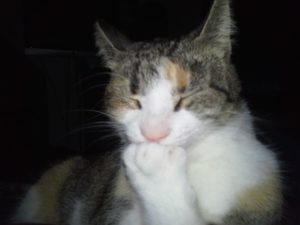 Our other rescue pets were excited about her arrival as well.” – Marlena, from Germany. ““Luna is from Lund shelter. We don’t know her story. We just know that she was there for a very long time. She wasn’t very talkative when we got her. Today she sleeps in my arm under the duvet and can act on command.” – Charlotte L Hansen, from Denmark. ““In the summer of 2006 a kitten suddenly showed up outside our house. He was extremely thin, had a large cut on his stomach and ridden with ear mites. It took me two days to catch him, but then only a few minutes before he calmed down and started purring. I already have 4 neutered male cats, and the plan was never to keep him, but we quickly had to give up that idea. He stole my heart! We named him Alvin and he is now as big a part of the family as the other cats.” – Jennifer, from Sweden. ““Sir George is my foster failure from 2 years ago with Diamonds in the Ruff Animal Rescue in Lockport NY. George came to me at 4 days old and right from the start was a medical learning process. He developed a hernia from straining with chronic diarrhea by 5 weeks old. He continued to struggle and failed to thrive until he was 9 months old. We did a lot of tests, and a lot of food trials. My vet is awesome and she wouldn’t give up – and neither would Diamonds. We finally found a diet that George could tolerate. He is allergic to dairy, fish and carbs. He has swung from diarrhea to constipation to just right. July 4th this year, he urinary blocked. My vet again is awesome and saved me a trip to the ER. He is on chronic medications as well as a special diet (which at one time included home cooked meals). 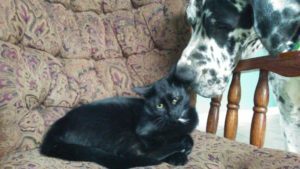 Due to the malnurishment at an early age, he is my “mini” kitty but is happy, and doing great!” –Cathryne, from USA. You can read more amazing stories on our Facebook page!